Today I unearthed two bankers’ boxes of West Queen Anne reunion materials collected by my father over the years. Hopefully this blog will find interest among other descendants of this school, prompting a dialog to further understanding of our parent’s experiences at WQA. 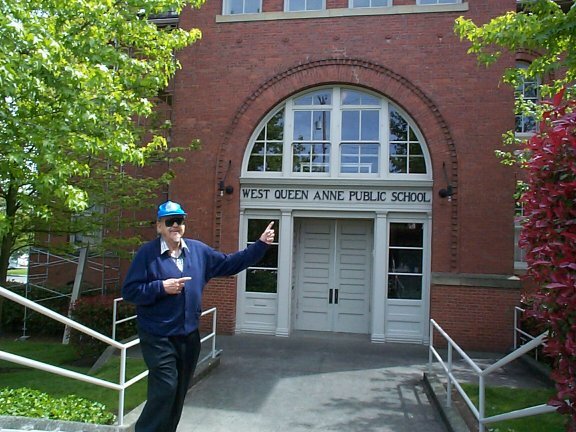 A proud graduate of West Queen Anne Elementary class of 1932 and Queen Anne High School 1936; my father, Glen S. Player, MD organized and supported class reunions for over 70 years. Following undergraduate studies at University of Washington (1936-1940) Dad received his medical degree in 1943 from the University of Oregon Medical School, now called the Oregon Health Sciences University. He completed post-graduate studies with the School of Neuropsychiatry at New York University 1944-1945 and took related classes at Cornell. During World War II, Glen served in the US Army as a neurology consultant, England General Hospital 1945-1946; and Halloran General Hospital 1946. At the close of the war, Glen returned to Seattle and set up his office at 1623 Queen Anne Ave North as a General Practitioner and Surgeon. He was a member of the King County Medical Society, and was a past national civil defense chair for the American Medical Association. When Glen retired he had served as a physician for 50 years, caring for the grandchildren of some of his original patients. As early as the 1950s, Glen showed a keen interest in genealogy. He left a written personal history and recollections of his parents and grandparents, so his posterity would know about their roots. His life spanned a time of great technological advances which he embraced. He participated in the computerized indexing of Ellis Island passenger arrival records. From Dad’s manuscripts, photos and scrapbooks I’ll pull more about the school and some of his classmates. Thanks for sharing. I went to school at West Queen Anne, kindergarten through eighth grade, as did my brothers and sister. I was there 1933 through 1941. When I saw the class picture, I thought it was my class. We wore the same middies and ties. I still have that picture, somewhere. I, too am “doing” genealogy, and was writing up my school days to include in a book I’m putting together for the family. I came across your web site while looking for images to include. My older brothers were probably at WQA at the same time your father was. Small world, thanks to internet.